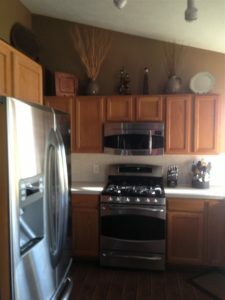 The customers home had a warm earthy feel with modern touches. They were drawn to a very specific cabinet finish, which is exclusive at Lowes. The cabinets were made of maple wood with a distressed Appaloosa finish, quartz counter tops, natural stone mosaic tile backsplash. The customers asked us to keep their original flooring which is only and option if you keep they same cabinet footprint as they did. This remodel brings an up to date, casual and inviting look to the space. 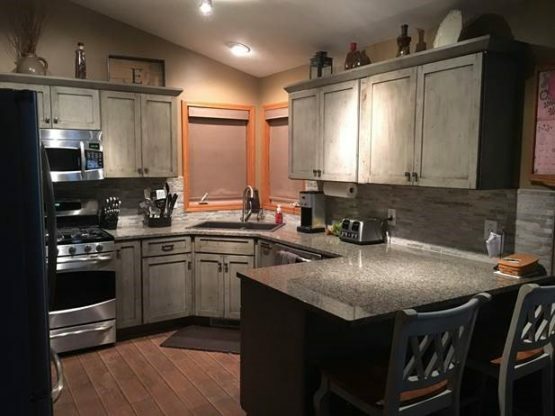 This is what we classify as a minor kitchen remodel (remove, replace and refresh). 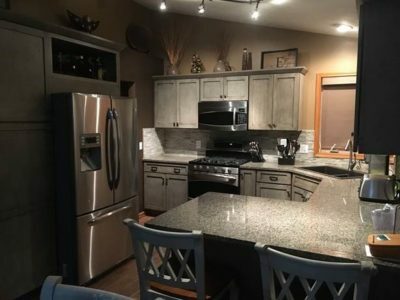 Unlike our example of a Minor Kitchen Remodel in our “COST GUIDE” section; most of the customers target budget was spent on special order cabinetry, counter tops and tile backsplash.